So I'm not really sure what to call this dish, but it's delicious anyway. Quarter the onion, and place it in the food processor, along with the cloves of garlic. Process until the onions and garlic make a paste. Turn the onion and garlic paste onto a skillet with 3 tbs of vegetable oil. Cook on medium-high heat until the mixture has browned. In the meantime, place the peppers and carrots in the food processor and let it run until a smooth paste forms. Add the pepper and carrot paste to the onion mixture, along with ½ cup of water. Let the mixture cook down until it becomes like a thick gravy. 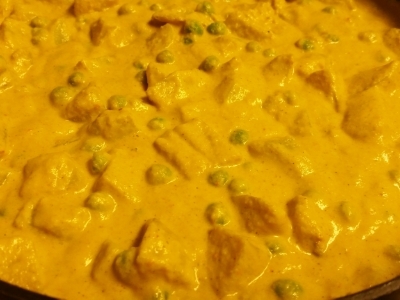 Once the mixture has thickened, add the curry, cinnamon, ginger, and paprika to the mixture. Then add the yogurt and sugar. If you want a creamier texture, then remove the mixture from the heat and put it in the blender. Process until the mixture turns smooth and creamy. Pour the mixture back into the skillet and continue to cook down. If the mixture looks too thick, then add the remaining ¼ cup of water. Add salt to taste. Add any preferred meats or veggies to the mixture (I used peas and roasted potatoes), then turn the heat down to low and let the mixture cook for about 30 minutes. I didn’t add meat to my mixture. Instead I paired it with my curry meatball recipe (click here). When your mixture is done cooking, scoop a healthy portion out and serve it over a bed of basmati rice.